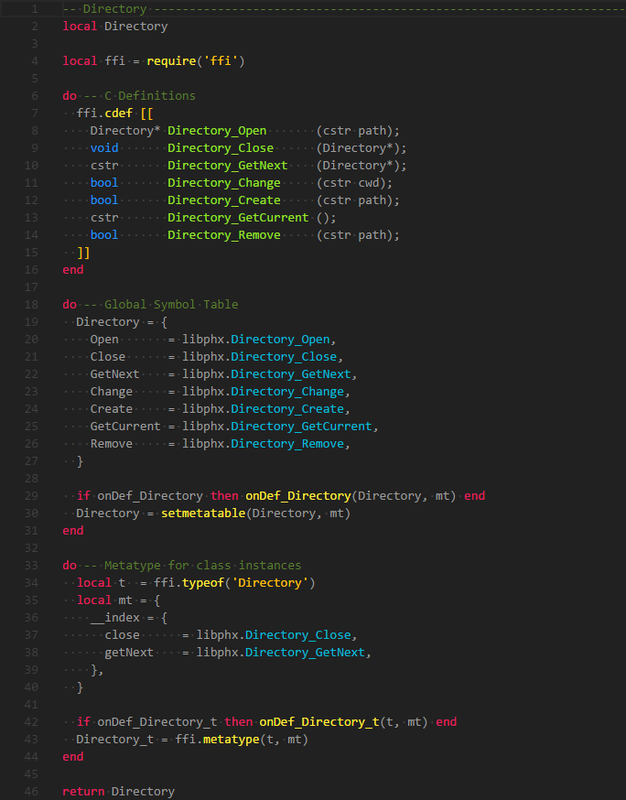 After fixing up the bindings I was reminded of, and annoyed by, just how haphazardly scripts were organized and loaded. We had Limit Theory scripts, Phoenix scripts, and general Lua utilities just clumped inside LT. Our other tools and testbeds always end up reimplementing the same general utilities because they aren't easily reused. I separated it all into 3 layers: Env, PHX, and LT and moved the first 2 into our shared assets folder. Env is general Lua utilities that don't rely on the engine, while PHX is engine bindings, extensions, and utility scripts that depend on the engine. 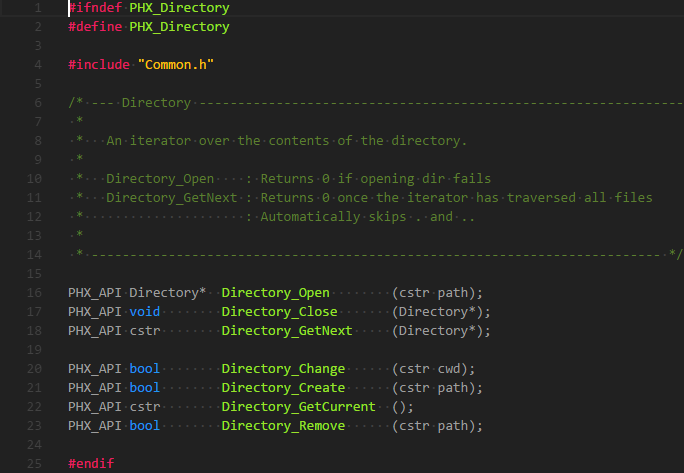 I also standardized a bunch of the Env scripts, added helpful functionality, and fleshed out unfinished ideas. My favorite products of that are requireAll and Namespaces. 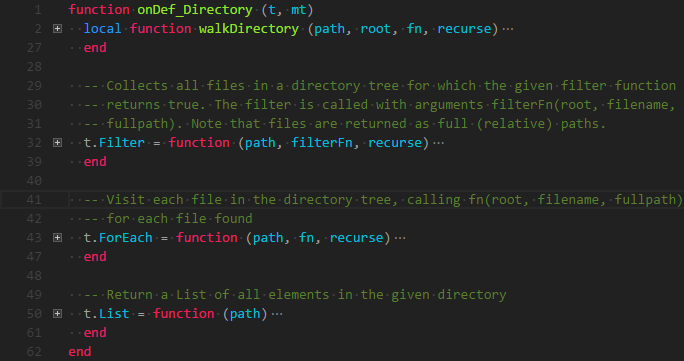 requireAll is a straightforward way to load all scripts in a directory recursively and return a hierarchical table. Under the hood it's using the built in require and package.path which means it works completely seamlessly alongside idiomatic Lua. Namespaces let us inject and optionally flatten those tables into the Lua global symbol table. No prefixing a bunch of code with PHX or Env. PHX.Vec3f(0, 1, 0) gets simplified to Vec3f(0, 1, 0). But the PHX table still exists for disambiguating symbols when necessary. Previously we had manually written scripts that loaded every script in a directory (non-recursively) and returned a table. I especially enjoyed nuking those. Of course this all lead to more UI iteration. I ensured keyboard focus moves appropriately when dealing with menus appearing and disappearing. I added 'modal' windows that are automatically closed/cancelled when you interact with something behind them. I improved the way containers calculate their size during layout passes so things like context menus get clamped to the screen automatically. I combined the old 'refresh focus when widgets are added/removed' and the new 'refresh focus when widgets are enabled/disabled' and drastically simplified it. Nice update, Adam, thank you! I don't think it's that we're sick of infrastructure as much as we're wary of diving down the rabbit hole again and getting consumed by development of the tool rather than the game: it's the all-in focus that we've seen before and don't feel is appropriate at this stage. It's fantastic to see you working on the actual game - that little video is beautiful to watch and really encouraging! I also like seeing Adam working on UI. That frees Josh up for actual gameplay and keeps him from getting distracted. The interesting thing about the dynamic that Adam and I have going on is that I'm really good at finishing 90% of the work what I perceive to be 90% of the work but is actually more like 50% of the work Adam, on the other hand, is the kind of detail-oriented person who can drive home the last 400% of the work (listen, we have some advanced math going on here in the office, don't bother trying to keep up :V). To be fair, Josh, yours were mostly in giant chunks, whereas Adam made many smaller ones. You put in more work than you're letting on. Adam's done awesome work, though, for sure. Outstanding all the way around -- great teamwork, and excellent focusing of Adam's time. I enthusiastically welcome Adam rationalizing the "guts" of LT's myriad systems because I know that's going to pay off in faster post-release support for fixes and enhancements. Basically, this is "productionizing" LT... and that's a marker of a professional-grade development plan. Naturally, I'm also stoked to hear about gameplay features in the works. I'm most happy to hear about thinking on zones. There's a phenomenal amount of gameplay fun that can emerge in a gameworld where overlapping volumes of space can have different functional textures. It's also satisfying to see that actual implementation of fleet control features is happening. Even if my first love will always be the 4X/strategic planning level, I know a lot of people are looking forward to the "RTS" level, and I'm happy to see progress there. Love that video clip! These aren't complaints -- just me looking forward to future updates. Heh. It does sound like the perfect partnership, dividing the work up to best effect. I honestly believe that the moment you recruited Adam was the moment LT the game really started to take off. I'm always at my best when I'm optimising the living daylights out of some existing code; @Adam, you're a rare breed and I doff my cap to you, sir. Ahh, I hope you're not feeling that I'm complaining about doing the infrastructure work: my intent with that remark was actually to reassure both Adam and you that doing that work is *not* a bad thing, and we do enjoy hearing about it still; for me, it was only the work on an item that was secondary to the game and engine and was kinda beginning to take over, that I felt was in danger of being all-consuming, that I was (what's the word? disappointed? Even that seems a bit too strong - maybe 'leery' is right) leery of. Guys, I think you're making great progress now, and it's great to read about the cool things you're working on - for me, this is exactly what I wanted when I backed the campaign and it's fantastic to see. In all seriousness, great log, great work. To you too, Josh, you too! Josh then ordered me to play some Freelancer to ensure I understand the heritage of Limit Theory. Don’t you dare. Thanks for the exciting mix of behind the scene and visible gameplay progress. You and Josh seem to make solid progress these days. Thank you Adam for the work and post! Another awesome devlog?! What a time to be alive. It's really fantastic to read about what you are working on, Adam- thank you for sharing with us. Only one Control is active at a time. Or is it always "you are doing this one exact thing right now!"? That is a great question. I also wondered about this. We actually had a great conversation about zones a while back in this thread, based on Josh's comments in his March 2014 devlog. I'll exercise my dark necromantic powers over that thread and see if there's more to say there now.